We began to dream of stainless steel replacing the off-white stove and a refrigerator that actually fit our kitchen. Our goal was to make it light and airy–a challenge with black granite countertops, to be sure. My Pinterest board was filled with gorgeous open shelving, white subway tile, and lots and lots of brass. Determined, my fiancé set aside a week in December to do the painting. We vowed only to use Craigslist for the appliances, and to do the tiling ourselves. As it was, our kitchen was a pretty dark and dreary place, and I desperately wanted to make the room feel larger, brighter, and taller. We chose to paint the upper cabinets and drywall in the same white paint and added white subway tile below to make the upper half of the room more cohesive. For the lower cabinets, we used a darker grey to provide contrast and anchor the dark countertops. Since we couldn’t install open shelving, we took off the doors of two cabinets and added false pieces to the front of the interior shelves. You’d never know, looking at them, that they weren’t built that way! While our budget restraints and the nature of Craigslist made this project take a little longer than others (about 3 months), it was well worth the wait! We also added a fun little chalkboard wall for our son on the end of one of our cabinets. I think the final touch will be finding a larger, colorful oriental rug for the floor. I contemplated adding a Roman shade over the window, but decided in the end I liked a cleaner look. What do you think? Is there anything you would add? To see the rest of our house, visit our Before & After page. Super inspirational job on a tiny budget. 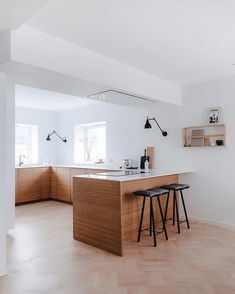 I have similar oak cabinets in my kitchen (I did luck out by getting the simple Shaker style cabinets above and below and a corner sink with two windows so there’s lots of light). Like what you did with the open cabinet. If the curved piece across the sink could be removed, would be great but if not, no prob. I’d add a short valance across the window in some cheerful color(s) to coordinate with a colorful rug (don’t know that I would go oriental) and I’d definitely have a happy green live something in the room (an apple green plant or a bowl of limes or similar). Better Homes & Gardens has a lot of practical projects on their website. Just found your kitchen today in a post from Apartment Therapy and yours is the one I copied into my Kitchen Projects folder. Thank you so much! I think adding a colorful valance is a great idea, and I agree that the room definitely needs a rug. You can kind of see it in the photo, but there is a hanging plant in front of the window and I usually have a couple other potted plants by the sink as well. So glad you liked my kitchen–good luck with your kitchen projects! I understand the valance might be tricky and in fact it might compete with the curved strip joining the front of the cabinets, so maybe scratch that idea. But definitely you need color. 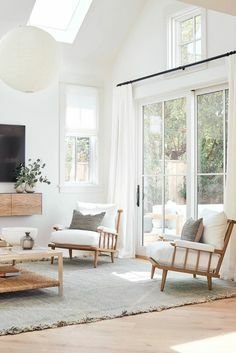 I see the little hanging plant now and that and the potted plants will bring in the needed greenery but maybe pots in some neat colors to coordinate with the rug you get. The pots wouldn’t have to all be the same. Melissa at TheInspiredRoom.com does at lot with small window stuff and Pinterest has tons on window herb gardens. I check frequently because although my 2-window corner sink is great for light, I’m somewhat vertically challenged and it’s hard to close curtains for privacy at night or reach over to water plants. I’ll be eager to see a pix of the finished product. You’ve done such a lovely job. I love the pendant lighting. I’m interested in buying that, but wonder if it lights the space well. Do you find that you need more lighting? We have an Edison bulb in it at the moment, which does not give a lot of light. However, we have under cabinet lighting which makes the room very well lit. If you used a different bulb it would probably be much brighter, but it is of course a single-bulb light and is never going to be as bright as a multi-bulb light. Hope that helps–I still love it! Hi love the open cupboard look ~ as a portion of my upper cabinets are the same style/colour etc…my others are much older and original….how are you finding the open cupboards with regards to dust etc – I had thought to see if I could find glass doors to replace some of the current ones to open and brighten up the space – not all of them as I don’t want ‘everything’ exposed :-) – however your option looks fabulous. So do I! I never had a problem with dust, but I did store only pieces we used every day so there was always movement and replacement with clean items. In our new kitchen (here in CO) we’re not even doing uppers, just open shelves and I can’t wait. I think as long as you’re using the items frequently and wipe down the area every once in a while, you should be fine. Love the transformation – both what you have done, and with the impressively low budget. I’m wondering how you found the cabinet painting work. Any hints/tips? Did you use an undercoat, or have challenges with even coating/drips? Hey Carol — thanks! I would say, use an electric sander if you can. That’s the hardest and most time consuming part (removing the original finish). I suppose you could strip them instead of sanding, but that’s the way we did it. Be patient with the painting, too — it’s worth buying a high quality brush or roller and doing multiple coats (or a paint sprayer if you have the space). That avoids drips, and improves the finish. for the new appliances to match as well. you painted the lower cabinets grey… very smart. Thanks so much Reg! We debated about upgrading the microwave to stainless steel, but in the end we liked how the old one blended in, just like you say. Plus, it was cheaper! I AM VERY IMPRESSED WITH YOUR WORK. LEAVING THE MICROWAVE SEEMS TO MAKE THE SPACE BIGGER RATHER THAN CHOPPING IT UP WITH STAINLESS. I AM TOYING WITH REDOING THE BOTTOM CABINETS IN DARK CHERRY AND THE TOP IN WHITE SO WAS VERY INTERESTED IN YOUR GRAY BELOW AND WHITE ABOVE. GREAT JOB! Thanks Joan! This was a fun kitchen flip (you should check out our latest one) I love contrasting cabinets too, but wouldn’t recommend mixing wood with painted cabinets — stick with one or the other. Happy decorating! lOVE WHAT YOU DID IN THE FIRST KITCHEN SINCE YOU HAVE REMODELED ANOTHER ONE IN THE MEANTIME, SO MY RECOMMENDATION IS TOO LATE: i WOULD HAVE OPTED FOR A COUNTER-DEPTH FRIDGE TO GAIN MORE SPACE AND FOR A MORE FLUSH APPEARANCE. Hey Karin — thanks! We actually did go for a counter-depth fridge, that’s what you see in the photos :). I, TOO live in Colorado. I recently sold my townhome in Centennial which had a kitchen nearly identical to yours. Mine was in the Sturbridge development. I found it difficult to come up with a truly useful kitchen space due to the way it was configured. i did improve the appearance greatly by also painting my dark,dated oak cabinets white and adding a dark(almost black) countertop and then new stainless appliances. i was sad to leave!